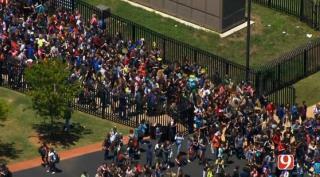 (Newser) – Schools across the nation were hit by a wave of robocall bomb threats Monday, closing buildings and forcing the evacuation of thousands of students, USA Today reports. Elementary, middle, and high schools in at least 18 states were targeted, and security expert Ken Trump says the automated calls seem to have all the signs of "swatting," hoax calls (often computer generated) meant to elicit a big response from law enforcement. Even schools in the UK were affected, with at least one receiving a warning that shrapnel from explosives would "take children's heads off," per the Independent. None of the threats were deemed credible, per NBC News. Now who is it who wants to close down public schools? Hmmmmmmmmm! LOL.... VOIP been around for 12 years, and that fact that's VOICE over IP, means its traceable, you door knobs. Was Trump really quoted in this Summary?